From Ettal in Bavaria to Garmisch in the Tyrol enjoy a walking holiday in one of the most beautiful regions of the Alpine foothills. Pass limestone plateaux, wild flower covered pastures and walk through charming villages with painted houses traditional to this region. Your accommodation for the first night of this trip is in the German village of Ettal. Set in stunning mountain scenery the Alpine town of Ettal is home to a Benedictine monastery built for Emperor Ludwig the Bavarian who was King of Bavaria from 1864 until his death in 1886. You may wish to visit the church and try the beer made in the monastery's brewery. Today you follow a valley which was once an important trade route between Venice and Augsburg. Walk on forest tracks, through pastures an on cobbled stones through traditional Bavarian villages. This area is famous for its folk art especially wood carvings. Arriving to Linderhoff you may wish to visit the ornately decorated Castle, built as a hunting lodge for King Ludwig II. Return to Linderhoff where you take the public bus to Garmish to spend the night. Today's 15km walk is expected to take approximately 4.5 hours and you will ascend 270m and descend 225m. From Garmisch you head out on foot passing by a dramatic gorge which in parts is up to 80m deep. Continue onto Schloss Elmau, this listed monument is an amazing site under the grey cliffs and the village of Mittenwald, it houses traditional wall paintings. Walk along the shores of two lakes to arrive to the village of Mittenwald amid the Alpine peaks and where you are warmly welcomed for a night in a typical Bavarian guesthouse. After saying goodbye to your hosts, a short train ride will take you into the Tyrol region and the charming village of Seefeld. From here easy to follow paths lead you to the lakes of Moserer and Wildmoos to finally to reach the village of Leutasch with its stunning flower adorned houses. Tonight's dinner is included and gives you the opportunity to try some seasonal local produce. Today's 18km walk is expected to take approximately 5 hours and you will ascend 600m and descend 600m. Today you cross a valley between the impressive mountains of Hochwanner and Hohe Munde. Crossing a pass with panoramic views takes you to the plateau of Wildermieming and on to the village. Today's 21km walk is expected to take approximately 6.5 hours and you will ascend 950m and descend 1250m. After a short taxi transfer to Obsteig your walk for today starts along a stream. Leaving the stream you continue until you reach the pass of Marienbergjoch (1789m). From here descend to the valley nestled in a vast mountain amphitheater-like valley formed by glacial erosion with views of the mighty Zugspitze. Walk to the small Tyrolean village of Ehrwald where you spend the night. Today's 15km walk is expected to take approximately 6.5 hours and you will ascend 1000m and descend 1150m. This final stage takes you under the Zugspitze, the highest Bavarian summit (2962m). 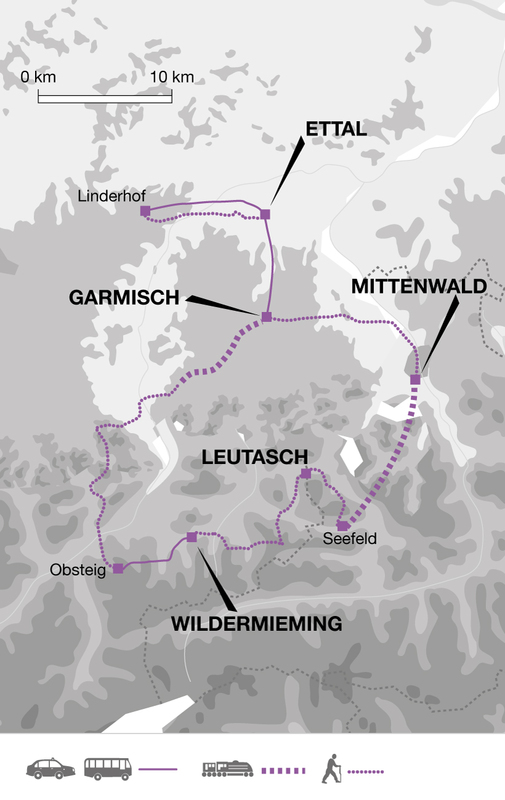 Today you walk from Tyrol back to Bavaria using a pass at 1476m before going back down to the beautiful lake of Eibsee. From here it is possible to reach Garmisch by foot or you could take the cog railway that goes down a 4.5km long tunnel carved into the rocks to the station on the valley floor. Once you arrive to Garmish the organised part of your holiday comes to an end. If you have time, you may like to extend your trip with a night in Munich. Today's 18km walk is expected to take approximately 4 or 6 hours depending on the route you choose. You will ascend 500m and descend 770m. We recommend flights into and back from Munich airport which is served by the budget airlines Lufthansa and EasyJet, from multiple airports in the UK. You can also use and non-budget airline (including British Airways) from multiple airports in the UK. For this trip you can fly into and back from Munich airport. From Munich take the train to Garmisch (there are a lot of connections) and bus to Ettal. Germany: Visas are not required by UK, EU nationals, Australian, New Zealand, US and Canadian citizens. Other nationalities should consult their local embassy or consular office. 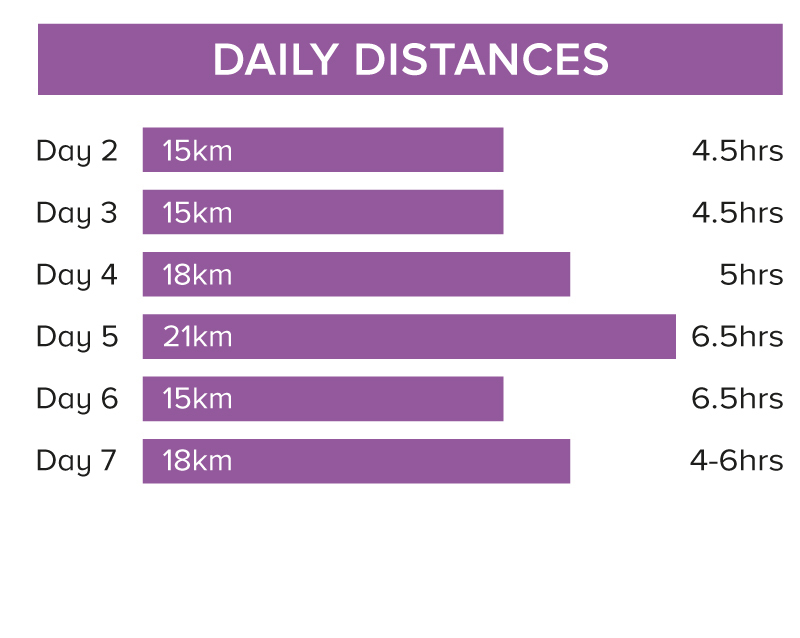 On this journey you walk 102km over 6 days (an average of 17km a day). You follow well-marked hiking trails. The route involves some steep ascents and descents of up to 900m and walks of up to 6.5hours. We have graded this route as moderate. Sat 15 Jun 2019 - Mon 30 Sep 2019 Your trip can depart anytime between the above dates. Contact us for triple room requests and solo traveller prices. Mon 15 Jun 2020 - Wed 30 Sep 2020 Your trip can depart anytime between the above dates. Contact us for triple room requests and solo traveller prices.